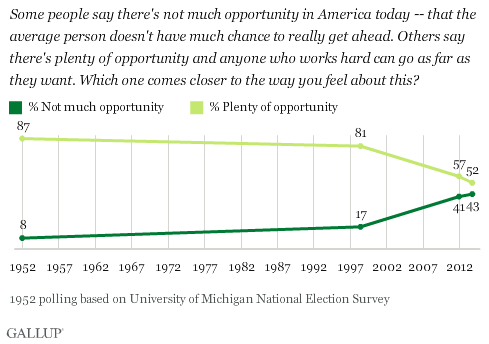 Fewer and fewer believe that there is “plenty of opportunity” to get ahead in today’s America – and that number is trending downward. As recently as fifteen years ago, optimists outnumbered pessimists by almost five to one. Today it is about even. Barely half of Americans believe that today’s youths will have a better life than their parents. This entry was posted in Link and tagged economy, poll by Spec Bowers. Bookmark the permalink.